In order to determine the proper ski length for kids, there are several factors to consider. Improper ski size cannot only be dangerous for kids but can make it harder for them to learn how to ski. No matter if you decide on renting or purchasing a pair of skis for your child, making sure that the size is correct is essential. Determining ski length for kids can be done several ways. Take into account the child's weight, height and his ability when calculating the size your child requires. One way that ski length can be calculated is by using the child's weight. Most skis are measured in centimeters. A child weighing between 40 and 50 pounds would use a ski that is 90 centimeters. If the child weighs 50 to 60 pounds, he would use a ski that is 100 centimeters. For every 10 pounds, add 10 centimeters. Skis are made in increments of 10s. Another way to figure out what length ski your child needs is to have him stand tall and measure the distance from the ground to his chin. Skis should come up to chin height. Younger skiers may use a ski that reaches between the chest and chin and older kids can use a pair that reaches between the chin and nose. The shorter the ski, the easier it is to control. Never buy skis that are too long in hopes that the child will grow into them. A pair of skis should last a child at least two seasons. Once your child becomes more experienced and able to master turns, a longer ski can be used. Intermediate skiers can choose skis that are around eye height. Age can also be a factor to consider when choosing the length of a child's skis. The younger the child, the shorter the ski. Kids under age six do not need a set of poles. Poles are not only dangerous to a child but serve no real purpose. All children should wear a helmet when skiing to protect him from falls and possible collisions. If you are in doubt about what type and size skis are best for your child, ask a professional. Most ski shops have staff available to measure your child and suggest the appropriate size and type of skis for him. Skis come in a range of styles and prices. 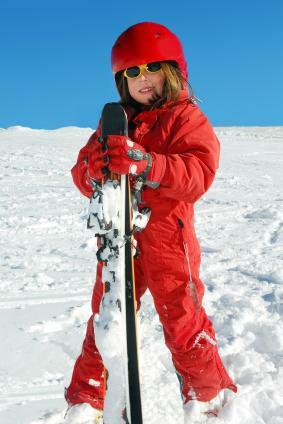 If your child is just beginning to ski, choose a less expensive option since he may grow out of them quickly. Many skis can be bought used on sites such as eBay or Craig's List. If you know what ski length your child needs, shopping online not only will save you money but time as well. Visiting a retail store can give you an idea of what to look for when shopping online. Another option to consider if your child is just starting to ski is to rent a pair of skis the first few times. Rental shops carry a range of ski sizes and can help you choose the correct length for your kid. Once your child feels comfortable on a pair of skis and is ready to continue skiing, buying him his own skis is an option to consider. Finding the proper ski length for kids is important for their safety as well as for their enjoyment. Skiing on skis that are not the right size can be dangerous and hard to control. Younger skiers need to have fun on the slopes to get the most out of the sport.